- This paint sprayer comes in handy when working with small areas or those tight places that are hard to reach with a larger paint sprayer. - Professional paint sprayer, suitable for any paint job, whether this may be to touch up some paint damage or your alloys and so on. 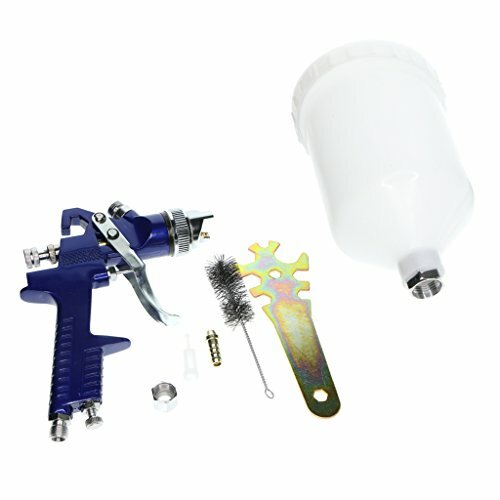 - This paint sprayer is the product you need to do a professional and successful repair. - This high volume, low pressure paint sprayer will get into all the small areas you struggle to spray, all them cracks and creases. - Perfect for recolouring, repairing and respraying, for leather craft, furniture, car, toy, etc. This paint sprayer is the product you need to do a professional and successful repair. Perfect for recolouring, repairing and respraying, for leather craft, furniture, car, toy, etc. This paint sprayer comes in handy when working with small areas or those tight places that are hard to reach with a larger paint sprayer. Professional paint sprayer, suitable for any paint job, whether this may be to touch up some paint damage or your alloys and so on. This high volume, low pressure paint sprayer will get into all the small areas you struggle to spray, all them cracks and creases.